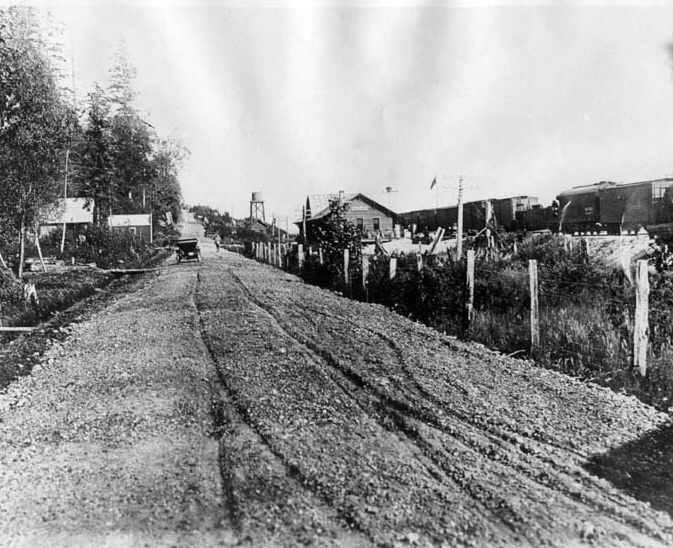 The Great Northern Railway limits beach access at White Rock after its completion in 1909. Mr. Thrift's reminiscences were first published by the Surrey Museum and Historical Society as a grestener printed, and stapled document produced by the Surrey Museum Press. Owing to the G.N.R. Co. constructing its new line along the waterfront at White Rock, without providing the facilities necessary for reaching the beach, will cause the public much inconvenience for all time, and might have been avoided had the Municipal Councils at the time exercised even common business ability in dealing with the Company. Unfortunately, none of the members of the Council were personally interested in White Rock or its vicinity, and when those who were interested urged the Council to protect the interests of the municipality, they were treated slightingly and of no particular consequence. During the year 1907 as the Secretary-Treasurer of the International Railway & Development Limited, I had occasion to go to Victoria with the company's engineer, for the purpose of examining the obtaining a copy of the survey of the right of way, together with plan and profiles of the G.N.R. new road proposed to be constructed from the Boundary Line along the waterfront of White Rock to the Bridge at Brownsville, now South Westminster and in going through these documents and plans I could not but observe the great injury that would result to the Municipality of Surrey, generally and in particular the inconvenience and loss it would be to White Rock for all times. The absorbing of our Road to the Boundary, the front street of the town site, and the closing of the street ends preventing free access to the Beaches, would very materially affect its future development. I waited upon the late Hon. Sir Richard McBride, at the time Premier, and pointed out to that worthy gentleman, the injury and loss to the Municipality would result from taking the old historic road, and one of the first roads constructed on the Mainland of B.C. to say nothing as to the effect on the future development of White Rock, Sir Richard gave me to understand so, for the Railway Company's application had not been granted, and that I could lodge a protest against the application being granted in it present form I could then inform the Municipal Council of what had been discovered in connection with the matter and of my action as a precautionary measure, I lodged a written protest as suggested, and on my return home I communicated to the Council the whole subject and the action I had taken, to preserve the rights of the Municipality and also of the public, I pointed out to the Council it was its duty and privilege to preserve and protect the rights of the Municipality, and begged of it not to lose any time in attending to the matter officially, what I had done was entirely of a temporary character. In a few days, I saw a report of the Council proceedings in the press, wherein it was stated my communication had been submitted to the Council, also that a resolution had been passed directing the Clerk officially and on behalf of the Council protest against any grant of land to the Railway Company along the water front of the town site of White Rock. Seeing that my little effort had been recognized by this Council and believing the legal advisor would be employed to take the necessary action, I rested content. The following session of the Legislature I had to again visit Victoria, and consult the places and profiles of the new railway, now complete and in operation, when to my utter disgust and bitter disappointment, I saw engrossed in this plan, the date in the month of June of the past year, plans, etc. accepted Crown Grant issued Lot 50 Group II - acres from the boundary line to the mouth of the Serpentine River with no exceptions for street ends, the public road from the mouth of the Campbell River to the boundary line, or the front street on the town site. On my arrival home I called in to his house at Cloverdale to see the Clerk and ascertain what had been done about the matter. I first asked the worthy gentleman if he knew where Lot (I do not remember the number of the lot but believe it was 506 Group II N.W. District, and the acreage between 50 x 60 acres). In reply the Clerk informed me there was no lot of that description in Surrey Municipality. I then enquired if he had not entered and assessed the lot on his assessment roll for-that year, as the lot was in Surrey. He had not dealt with it at all, knew nothing about it, where it is located. I asked what had been done about the street ends, etc. at White Rock. Hell he had, personally written the Government protesting against the railway cutting off access to the beaches. Did the Government reply? Yes, they asked him what street ends were required to be left open, also a plain or map showing those street ends. Did you receive this information as asked for? Yes, I sent one of the maps of the Municipality (got out by the Surrey Board of Trade several years before) and marked thereon with pen and ink the street ends across the Town site. I asked if he heard anything further from the government respecting the plan sent at its request. He answered �no�; he was still waiting to hear from the Department to learn what action had been taken in response to his protest. Then you were not aware that the government had issued a Crown Grant for the right of way and it was registered as the lot I described to you, with no provision for access to the beaches on street ends or section or half section lines. Well, he could not understand the matter at all. Thus our worthy Council sacrificed our right of free access to the beaches for all time through the lack of a little business foresight and the neglect to furnish proper plans showing what they were protesting about etc. etc.